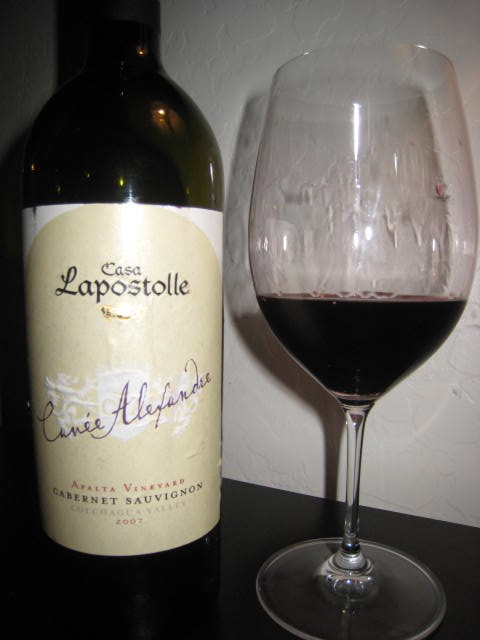 The 2007 Casa Lapostolle Cuvée Alexandre Apalta Vineyard Cabernet Sauvignon is a single vineyard wine sourced from the Apalta Estate located in Chile's Colchagua Valley. It's composed of 85% Cabernet Sauvignon and 15% Merlot and was aged for ten months in French Oak Barrels. On the nose this wine immediately sings true to Chile and the the great terroir of Colchagua. It has loads of scorched earth, black pepper, black currant, crushed rocks, anise, and gamey aromas. As the wine opens up the minerality, oak, and hints of black cherry begin to really come forth. There is also some very significant peppery aromas that definitely gives this wine a true Chilean aroma profile. On the palate the wine continues to shows it's overriding rusticity and earthiness, with flavors of graphite, crushed rocks, soil, pepper, oak, plum, and tobacco. Fruit wise this is exactly what black currant would taste like with a bunch of graphite and crushed stones mixed in. I drink wine occasionally. It's good. I think it's actually a good blend, it's not perfect, but not horrible either. What other similar wine, but better would you recommend?